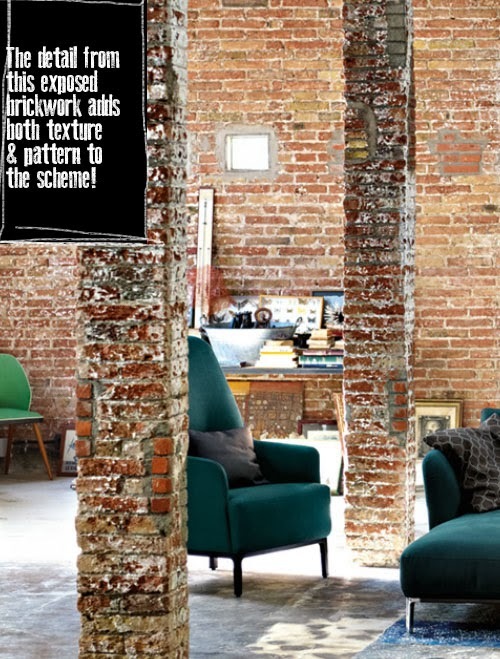 Industrial chic continues to rock my world and this exciting interior trend has inspired many new and innovative collections, not least of all the Scala modular sofa range from designer, Rolf Benz. I wanted to include this setting on Brit Decor because it has all the detail and richness of a Renaissance painting with a plethora of pattern, colour and texture - wow what a combo! Whilst there are a growing number a stunning graphic brickwork wallpapers available, it's hard to beat the raw texture and detailing created by the exposed brickwork, which is also reminiscent of the reddening Autumn leaves, don't you think? The Scala design has an "urban serenity" and sits effortlessly in what would have once been a far from domestic setting. There is plenty to learn here from the sophisticated styling and soft industrial vibe. 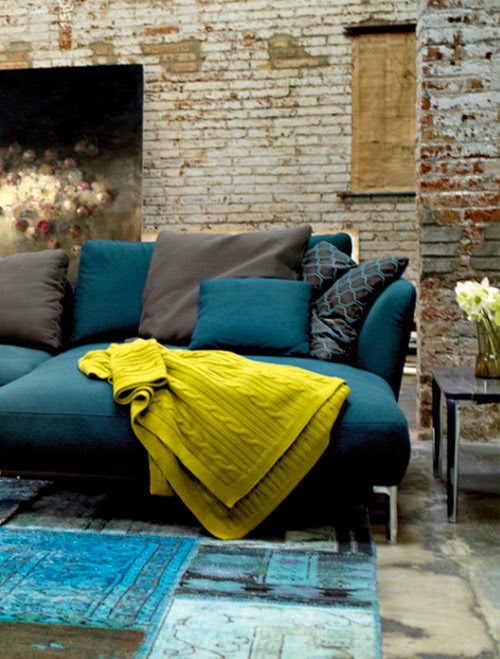 The colder, harder lines of the brickwork, pillars and the industrial height ceiling have been counterbalanced and softened by a plentiful supply of colour co-ordinated cushions and a beautifully tactile knitted throw, all of which co-ordinate perfectly with the Petrol blue Scala sofa. This rich and alluring blue has also been cleverly translated into the rich aqua colouring of the eye-catching rug. I am also hugely inspired by the leaning artworks and stacks of books, which serve to further enrich this relaxed and informal style. Try this at home folks - gather a handful of your favourite prints and photos (framed or unframed) and lean them against a wall for an instant gallery style feature. Using these Rolf Benz images as a focal point for my colour palette, I have picked some knock-out pieces to compliment this. Look at the stunning muted tones in the Harlequin cushion from Clippings. This type of multi-colour pattern always works well in tandem with solid blocks of colour and looks amazing against the Rox blue cube from Habitat. Well that's my industrial dose of Monday inspiration, what's inspiring you today?